This boasting over the deployment of armed battalions on Russia’s very borders came as a summit of NATO foreign ministers being held in Washington approved plans for the dispatch of NATO warships to the Kerch Strait. This passageway between the Black and Azov Seas was the scene last November of a provocation by Ukraine that ended in an armed confrontation in which Russia seized three Ukrainian ships and some two dozen sailors. “We are going to make sure that we have the capability to deter a very aggressive Russia,” US ambassador to NATO Kay Bailey Hutchison told reporters on Tuesday on the sidelines of the NATO foreign ministers’ meeting. 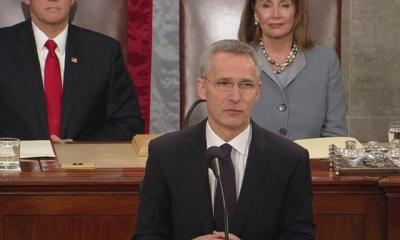 Stoltenberg also solidarized himself with Washington over the Trump administration’s ripping up of the 1987 Intermediate-Range Nuclear Forces (INF) Treaty, noting that “NATO allies have supported the US position on that strongly.” Washington’s action, justified on the basis of unsubstantiated claims that Russia has violated the accord, opens the way to a dangerous new nuclear arms race. Democratic lawmakers were the most enthusiastic in cheering the NATO secretary general, clearly seeing their praise for him as a rebuke to Republican President Donald Trump, who in his 2016 election campaign described the NATO alliance as “obsolete,” and has repeatedly charged that European members are taking advantage of the US by relying on its military might while achieving unfair trade advantages. At the same time, with the report by special counsel Robert Mueller failing to confirm incessant Democratic claims of Trump’s “collusion” with the Kremlin in alleged interference in the 2016 elections, the Democrats’ embrace of Stoltenberg is part of the continuing drive by the party to oppose the Trump administration from the right with demands for an even more aggressive militarist policy against Russia. While Stoltenberg tried to portray the increasingly acrimonious divisions within NATO as “a sign of strength” and “democracy,” US Vice President Mike Pence, speaking at a NATO anniversary event in Washington, delivered what amounted to ultimatums to both Turkey and Germany to submit to Washington’s diktats, or else. The US vice president was referring to Ankara’s decision to buy S-400 missile defense systems from Russia, against which Washington has retaliated by stopping delivery of F-35 fighter jets that are being provided to other NATO countries. Oktay’s reference was to the Pentagon’s continued arming and support for the Syrian Kurdish separatist YPG militia, which Ankara views as a branch of the Turkish Kurdish PKK movement, against which it has fought a bloody counterinsurgency campaign for decades. Earlier, Turkish Foreign Minister Mevlut Cavusoglu, speaking at another event in Washington, made it clear that Ankara was not about to bow to Washington’s demands. While the German government is rearming on a scale unseen since the downfall of Hitler’s Third Reich—increasing military spending by 40 percent since 2014—Pence cast Berlin as shirking its responsibilities. More pointedly, he denounced the German government for moving ahead with the Nord Stream 2 pipeline project, bringing Russian natural gas to Germany through the Baltic Sea, insisting that Germany ran the risk of becoming a “captive of Russia.” Washington has pressed for Germany to accept liquefied natural gas, delivered by US companies, as an alternative to Russian gas. In his meeting with Stoltenberg on Tuesday, Trump pressed on the same issues, while apparently attempting to soften the tone of the nakedly imperialist interests being pursued by Washington by declaring his “great respect” for Germany. This was the third time that Trump has publicly claimed that his father, Fred Trump, was born in Germany, when it is public record that he was actually born in New York City in 1905.